Keeping your home or business clean and inviting is more than just dusting and scrubbing toilets. There are countless tasks and projects that must be done consistently to protect and enhance your home or business property — maintenance. That’s what we do. Nap’s Maintenance serves residential, commercial, and industrial customers in Massachusetts and Rhode Island. We are a local company that is known in the community for quality service and attention to detail. The most important aspect of service for us, is the person-to-person relationship. Our customers are like family to us, and we treat your property the way we’d treat our own — with care and professionalism. 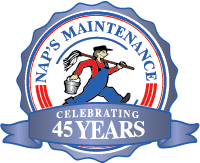 Browse our website to learn more about our service offerings, and contact Nap’s Maintenance today!